Power Athlete (パワーアスリート) is a 1992 fighting game for the Sega Mega Drive and Super Nintendo Entertainment System developed by System Vision and published by Kaneko. 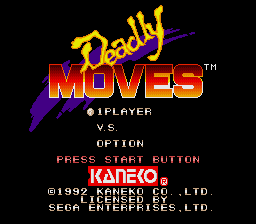 In the US, the Mega Drive version was renamed Deadly Moves, with the Super Famicom/SNES version becoming Power Moves. Both the Japanese and US versions uses English text. The protagonist Joe aims to become the world’s strongest fighter by challenging Ranker, the game’s final boss. and moves the character to a higher or lower plane, similar to side-scrolling beat-'em-up games like Streets of Rage. Ranker can be unlocked using cheat codes. Power Athlete was released before numerous fighting game "standards" were set by Street Fighter II, and thus there are no Street Fighter II-style combos to perform. In RPG fashion, enemies can be challenged multiple times to level your character up (and exploit the score system). Special moves don’t cause any block damage unless your character is highly leveled up. There are two long bonus stages that can be used to collect extra points. Progress is recorded through a password system. The final boss can be easily defeated by fully leveling up your character and throwing projectiles from the other side of the screen. Ranker will block all of them, slowly succumbing to the block damage taken. It's an American fighter that looks like Ryu from Street Fighter. He's the only playable character from the single-player mode. A Hawaiian grappler. Warren's technique names are patterned on surfing terms - "Big Wednesday", etc. A huge Russian wrestler with onyx skin. The game manual for this version refers to Vagnad as a survivor of The Holocaust. A kabuki-style fighter who can teleport and attack with his hair. The only female fighter of the game. A tribal Kenyan warrior with a beastial appearance. The Mega Drive and Super NES versions of Power Athlete are virtually the same game, save for a few minor graphical differences. For example, Joe uses blue "bracelets" in the Mega Drive version, while on Nintendo's console they are red. Shadows are also semi-transparent on the Super NES, as opposed to the solid black seen on the Mega Drive. There are other minor palette changes, witnessed in areas such as the upgrade screen. Beating an opponent in the Mega Drive version also leads to a longer victory sequence, in which rather than calculating a score and fading straight to black, the background fades and then the score is calculated. Main article: Deadly Moves/Magazine articles.